The Clinton Global Initiative, which arranges donations to help solve the world’s problems, set up a financial commitment that benefited a for-profit company part-owned by people with ties to the Clintons, including a current and a former Democratic official and a close friend of former President Bill Clinton. The $2 million commitment was placed on the agenda for a September 2010 conference of the Clinton Global Initiative at Mr. Clinton’s urging, according to a document from the period and people familiar with the matter. Mr. Clinton also personally endorsed the company, Energy Pioneer Solutions Inc., to then-Energy Secretary Steven Chu for a federal grant that year, said people with knowledge of the endorsement. The Clinton Global Initiative’s help for a for-profit company part-owned by Clinton friends poses a different issue. Under federal law, tax-exempt charitable organizations aren’t supposed to act in anyone’s private interest but instead in the public interest, on broad issues such as education or poverty. The commitment was a late addition to the agenda for the September 2010 conference, internal Clinton Foundation documents reviewed by the Journal show. According to one document, about two weeks before the conference, Ms. Samuel contacted an official in the Clinton Foundation’s commitments office and said Mr. Clinton wanted to feature her commitment to Energy Pioneer Solutions at that month’s gathering. Ms. Samuel’s spokesman didn’t respond to a question about that. One of Mr. Clinton’s top advisers at the time, Doug Band, tried to prevent the commitment from being added to the agenda as an onstage event in the weeks prior to the conference, according to a document reviewed by the Journal. The commitment was entered into a database on the Clinton Global Initiative website. A few months later, it was removed. The reason was to avoid calling attention to Mr. Clinton’s friendship with one company co-owner, Ms. McMahon, and to protect the integrity of Mr. Clinton and the Clinton Global Initiative, according to people familiar with the matter. The Clinton Foundation spokesman said the information was withheld at the request of Ms. Samuel, the announced provider of the commitment. Her spokesman didn’t respond to a question on that. After the Journal asked about the absence from the database, the Clinton Foundation said it was making a policy change and would publish all previously unpublished commitments and all future ones. At the U.S. Energy Department, which had a grant program to encourage innovative approaches to weatherizing low-income people’s homes, giving a grant to a for-profit company was rare but permitted, said T.J. Hansell, a former contractor to the agency who worked on the program. An Energy Department spokeswoman declined to comment. An Energy Department news release in 2010 announcing a grant to Energy Pioneer Solutions called it “a women-owned small business,” repeating language in the company’s application, which the Journal obtained under the Freedom of Information Act. Mr. Kleeb, the company’s founder and 29% owner, didn’t respond to a question on why it described itself as women-owned. Oh, and it shouldn’t shock anyone that some of the owners of Energy Pioneer Solutions, Inc., like Mark Weiner, are donors to the Clinton Foundation. Hillary Clinton has paid Weiner’s company millions for campaign swag in her 2008 and 2016 presidential bids. As Guy mentioned, this isn’t just for private business ventures, it has even impacted international agreements. When the Russian Rosatom State Atomic Energy Corporation wanted to buy the Canadian-based Uranium One, in which they would end up closer to controlling most of the world’s uranium supply, the Committee on Foreign Investment, of which Clinton is part of, had to approve the sale, given the national security questions involved; the company had mining states in the Western part of the United States. The Russian takeover took place between 2009-2013, in which the chairman of Uranium One, through his own family foundation, gave the Clinton charity four donations amounting to $2.35 million. At the time, these donations were not disclosed. 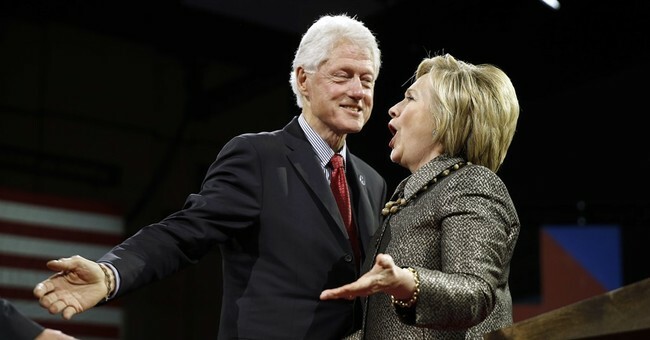 After the Russians made their intentions known concerning assuming control of Uranium One, Bill Clinton gave a speech for $500,000 from a bank that was connected to the pending agreements—they were selling the company’s stock options. In the end, the deal was approved. There are other stories—how over 1,000 donors weren’t disclosed, how the Foundation has been viewed as essentially a slush fund for the power couple, and how this family non-profit venture is anything but transparent. Last fall, the State Department slapped the Clinton Foundation with a subpoena to turn over all documents from ventures that might have required government approval while Clinton was secretary of state. In December of 2015, The Wall Street Journal reported that Bill Clinton had been given millions from two dozen companies and organizations that had “matters before Mrs. Clinton’s State Department” while she served as our top diplomat, some of his paid speeches, like his two trips to the United Arab Emirates, were arranged by the State. He collected $1 million for those appearances. In Abu Dhabi, the United Arab Emirates wanted a facility to pre-clear travelers prior to entry into the United States. By 2011, a letter of intent was signed, and Bill Clinton gave a 20-minute talk on climate change in the country for a fee of $500,000, added the Journal. In December 2012, Bill asked for authorization to give another $500,000 speech on the importance of tourism in Abu Dhabi—one week after the speech, the U.S. and Abu Dhabi agreed on a screening facility for Etihad Airways. This woman could be the next president of the United States, and part of an organization that has a long history of rewarding friends after monetary donations are doled out. Just look at the 180-degree turn she did with the Colombian Free Trade Agreement after Canadian financier Frank Giustra gave money to the Foundation, as did the oil company he founded that was operating in the country. They were also part of the labor rights controversy that had held up the agreement. Giustra now sits on the Clinton Foundation’s Board of Directors. No one sees the ethical questions with any of the dynamics relating the Clinton Foundation that receives millions from corporations, foreign nationals, and other entities, with one of the founders occupying the presidency in which a lot of favors can be worked out. Clinton and Obama had disclosure agreements before, which she more or less chose to follow on a case-by-case basis. In the Oval Office, she could simply invoke executive privilege if anyone asks questions. This seems to be a bit more problematic than Donald Trump possibly acting as his own spokesperson to bolster himself.